Rumors of Apple venturing into the automotive space have been swirling for quite a while, and that swirl really swirled the swirl when Apple-watchers determined that a company called SixtyEight Research is likely a shell company for Apple’s automotive R&D. Also telling is that company is known to have bought just one car, and that car could be full of clues about what Apple is thinking. Keep in mind Apple has more money and resources than the president of God’s country club, and they could have bought absolutely any car they wanted to for this new venture. That’s why I think it’s very significant and telling that the one car they are known to have bought is this: a 1957 Fiat Multipla. Now, this has been known for a few months, but I don’t think the overall implications of why this car was purchased have really been explored. Many sites have attributed the purchase to Apple Design Chief Jony Ive’s known love of early rear-engine Fiats, and his charity auction (with Marc Newson) of a 1959 Fiat Jolly, but I don’t think that’s really the motivation. In any case, even if they’re based on similar mechanicals, the concept and design of a Multipla and a 600 Jolly (or even a conventionally-roofed sedan) couldn’t be more different. It’s also important to consider why Apple bought this car for their secret automotive-project holding company. It’s not for technical reasons; I doubt they’re planning on introducing a car with a 600cc rear-mounted gasoline engine, and they’re much more likely to have purchased a Tesla or something more modern if they want to reverse-engineer anything. The car had to have been purchased as a sort of inspirational design object, something the designers of Apple’s car can have around, to examine, question, scrutinize, to spark ideas, and so on. There’s many cars that one would think much more likely to be picked for the role of inspiring one of the greatest design teams working: a Jaguar E-Type, a Lamborghini Miura, a DeTomaso Mangusta, for example. But Apple’s choice of the clever, humble Multipla speaks volumes about their design direction for their potential car. It’s also critical to remember Apple likely isn’t building a car in the sense of a car they could mass produce for people to buy; it more likely has to do with autonomous mobility than killing Tesla, or even developing software for established partners. We don’t know yet. This is probably the most important one. 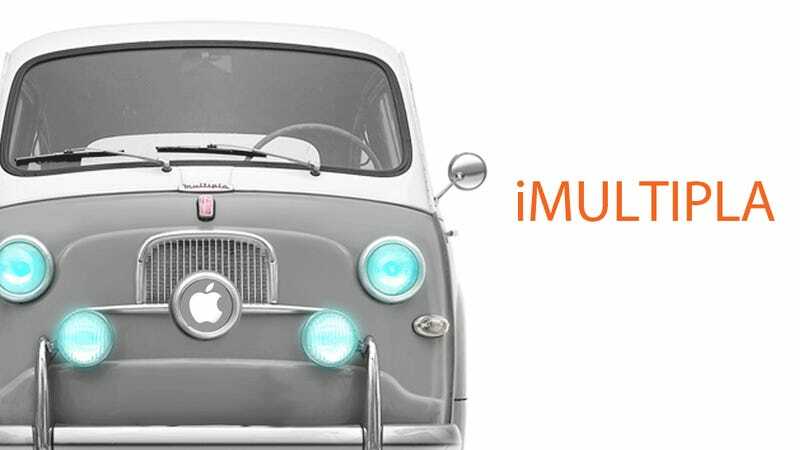 Based on their choice of the Multipla, I think this means we can expect that whatever Apple does end up with—if they end up with anything—I wouldn’t expect it to seem familiar. The Multipla certainly wasn’t. It was based on the Fiat 600, a sub-Beetle-sized two-box little rear-engined four seater, and while retaining the same body as the 600 from the 600's B-pillar back, the Multipla added onto that a radically novel van-like body, with cabover-like seating position, that allowed the still-tiny car to seat six (or more) in three rows, or hold a quite large amount of cargo. It wasn’t quite a van, it wasn’t quite a car, but it was a design innovation. I say this because the Multipla is a perfect example of a car designed with its interior volume and packaging as the primary focus. You wouldn’t have a Multipla in your design studio if this wasn’t important. The Multipla was a packaging triumph, all the more so when you remember that Fiat used the entire rear clip of the 600, limiting the height and width of the car. With the engine tucked way out back, the focus moves to the middle of the car, which is pretty much an open box that can have a seat or not, depending on the needed use. You can think of a Multipla as a cockpit for two, with a large open hold behind it, and then a bench seat. That middle area can be used for people, cargo, or some mix of both. It’s a remarkably flexible and efficient design, large inside, small outside. The Apple car, with its very likely focus on autonomy, will have an interior that’s not the driver-focused two-rows of seats we’re used to. I think we’ll see a much more open and flexible interior space, an almost mobile-room motif. For this reason, if Apple were to purchase another inspiration car, I wouldn’t be surprised to see a Stout Scarab. A Multipla is so beyond what most people expect from a car that it suggests that Apple may be trying to position themselves away from the pack of car makers by making a car into a ‘transportation system’ or something. This would be much like what they did when they introduced the iPod, an MP3 player that almost nobody ever called an MP3 player. I think the Multipla says they want to separate themselves from established auto design, and I think part of that might be a total rebranding of what their product actually is, to get people thinking in terms of cars or a new category of Apple transportation machines. Again, we have no idea what Apple is up to—a design concept, a mass-transport bus, a private car, or something else entirely. As much as I adore the Multipla, I know it’s not a usual top pick for gearheads—at least mainstream gearheads. And I think Apple has no interest in targeting traditional car lovers for their car. The Apple car will be a carefully-designed, appealing tool and object for people who barely care about what car they drive. I think Apple will leave the techno-electro-gearhead market for Tesla, with its Ludicrous Speed options and more traditionally attractive car look, and go after the vast population of people who just think of their car as an appliance. Look, you don’t buy a Multipla if you just want some lovely bit of automobilia to inspire your designers; a Multipla is a non-conventional risky car that, frankly, a lot of people just won’t get. If this is really what Apple is making their designers hover around, then I think it’s a safe bet to say Apple won’t be playing it safe, and there’s a decent chance it could flop. As much as I’d be happy with a technologically-modernized Multipla, I don’t think Apple’s eventual design will really resemble one much at all. But conceptually, I think this weird little Italian may be the core around which Apple builds their iMove or whatever the hell they end up calling it.